There are a few certainties in this world; the sun will rise in the east, your neighbor’s yippy dog will keep yipping at two in the morning and there will always be someone working to put out a good platform-shooter video game. 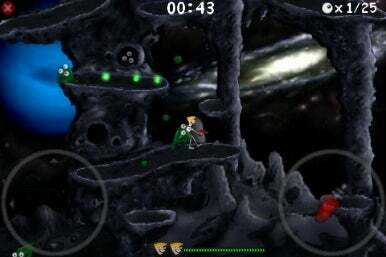 Enter Globs, a platform-based, arcade style shooter for the iPhone and iPod touch by Chad Towns in which you take control of Nerdman, a geeky biologist who must explore alien worlds, shooting creatures known as “boogers” with his blaster while collecting eyeballs for scientific research. Help Nerdman shoot Boogers and capture their eyeballs. Although this isn’t the most intricate plot in the world, there’s something to be had here. Globs combines lovingly crafted graphics, complete with an old-school arcade feel with immersive sound effects and a bouncy background audio track. The end result is a familiar-but-fun blend of platform jumping, ducking, shooting and dodging green small green space aliens that will all-too-happily latch onto Nerdman’s face for about several seconds (duck to get them off), reducing your jumping ability and making it impossible to fire your blaster. Globs is a work in progress but a good one. A convenient tutorial shows you the ropes, an option to play left handed is a nice touch and the game’s fast-paced jumping and shooting actions combines the better elements of “Earthworm Jim” with “Sonic the Hedgehog”. A well designed save system, automatically save your progress on the fly and allows you to quickly pick up where you left off and proves to be a nice bell and whistle for the application. The game is being steadily updated (a version update from 1.1.1 to 1.1.2 saw a marked improvement in the game’s controls), the controls still take some getting used to and you might find your left hand sliding a bit as you overcompensate to jump. A global scoreboard would be fun to compare your score against other players and the game’s menus feel as if they could be more intuitive/somewhat easier to access. It looks like Towns will be receptive to the needs of his customer base, though some are bound to wonder why he didn’t wait to release the game until locking down the feature set. A new 1.1.3 release came out since I wrote this review, adding new levels and other changes, and Towns has announced more plans for the game through 1.1.5. The title may not be perfect, but it is a fun way to slaughter aliens for 10-15 minutes at a time and becomes worth its $1 iTunes App Store asking price. Globs requires iPhone OS 2.2 or later to install and run.